Pets Costs > How Much Do Duck Eggs Cost? How Much Do Duck Eggs Cost? Duck eggs are typically purchased by those who are allergic to chicken eggs or who want creamier yolks. On the other hand, duck eggs for hatching are preferred by those who wish to raise ducks as pets or for domestic consumption. Depending on the size of the egg, the time of year and the duck species, the cost of duck eggs will range anywhere from $1 to $3 each for hatching. By the dozen, it should be around $5 to $9. However, in areas where there is a surplus, the costs can be as low as $2 to $3, and rare breeds can fetch prices as high as $50 per dozen. If it’s for eating, then the costs can be $3 to $12 per dozen, depending on the same factors. Refer to our table below to see what it may cost for popular species. At Salmon Creek Ranch in Bodega, California, for example, jumbo duck eggs will cost $10 per dozen. Other egg sizes are available on a seasonal basis. LocalHarvest.com offers duck eggs from a flock of heritage free-range grass-fed ducks in Central Florida. Here, medium eggs cost about $1 each while the jumbo and large eggs cost around $1.25 each. Modern Farmer says the average cost per dozen is about $6 to $12 in the United States. Duck eggs can be purchased either individually or in cartons just like chicken eggs. These eggs are commonly found at your local farmers market or specialty grocery stores such as Trader Joe’s. If you’re unable to find any here, then you can contact a local duck farmer to see if they have any available for sale for the public. Many suppliers sell duck eggs produced from a free-range production system. At some farms, ducks are fed organic pasture grasses as well as organic feed to produce organic duck eggs. If you were to purchase duck eggs online, additional shipping fees may apply. People who are allergic to chicken eggs will find that duck eggs are a perfect alternative; however, those who have severe egg allergies will need to consult with a doctor before eating or handling duck eggs. The taste is similar to that of a chicken egg but can be more intense because the duck’s diet is different than a chicken. Ducks, unlike chickens, can feed on bugs, slugs and other high-protein critters over plants, which, in turn, affect the final taste. 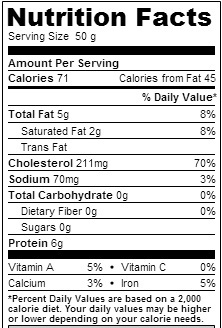 Duck eggs have nine grams of protein whereas chicken eggs have six grams. The higher protein levels in duck eggs make them a better option for recipes requiring yolks. 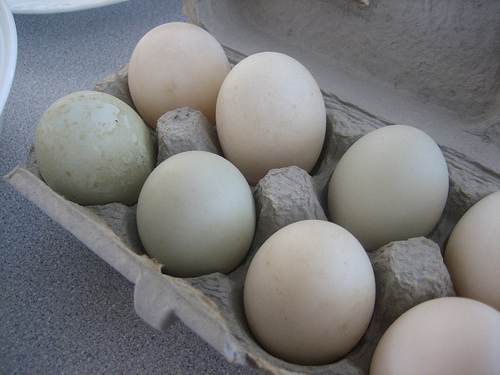 One jumbo duck egg can be a good replacement for two to three average-sized chicken eggs. Pekin ducks are the most commonly found type of duck in the country. Aside from being very hardy, they are easy to hatch. Pekins and Mallards are the most commonly shipped duck breeds today. Other breeds are usually available from February to August, depending on the supplier. Fresh duck eggs keep for approximately six weeks once refrigerated. Like a chicken egg, duck eggs can be cooked exactly the same way. They poach well, boil well and even scramble better due to the creamier and richer taste/texture. In terms of inspection, duck eggs have the same regulations by the USDA as chicken eggs. Visit a farmers market. Farmers often sell duck eggs and other produce at considerably lower prices than at grocery stores. With duck eggs, the more you purchase at once, the more you should be able to save. Wholesale discounts may be available with some suppliers. I paid $6 for a dozen organic grass-fed first generation ducks eggs. They were far tastier than chicken eggs! Definitely buying more!